All Student Parliaments meet in the Hockney building at lunchtimes, 12.20pm-1pm. Parliament and General Meetings are where the big decisions get made! Student Parliament is the highest decision making body of the Union. It can set policy for the Union, mandate Executive Officers to carry out work, hold Trustees and the full-time officers to account and amend the Union’s constitution if enough students are there. Decisions made at Parliament can only be overruled by a referendum of all students, and it can overrule the Executive Committee if it wishes. WHO MAKES UP STUDENT PARLIAMENT? EXECUTIVE COMMITTEE – The President and other elected student officers on the SU Exec report to Student Parliament as a whole. FACULTY REPS – each HE Faculty gets 1 vote at Student Parliament. DEPARTMENT REPS – each FE Department gets 1 vote at Student Parliament. 10 GENERAL MEMBERS – students elected to or attending Student Parliament can have up to 10 votes between them. All Bradford College students can attend meetings of Parliament or General Meetings. It is a great way to find out how your Union works and to get involved in creating positive change at Bradford College. Parliament meets twice each term and meeting dates and times will be well advertised around campus and via social networks. 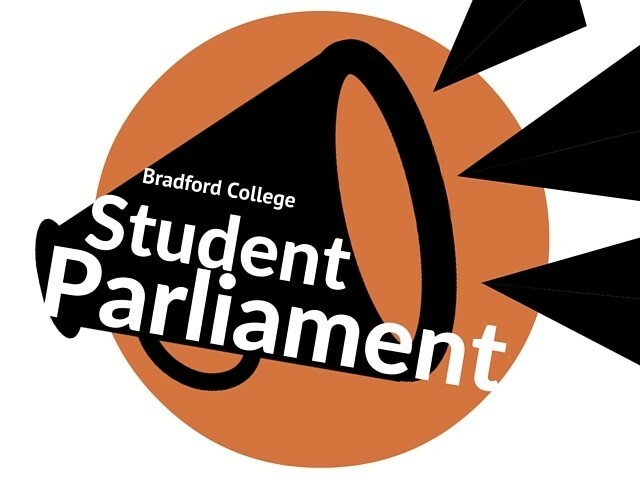 If you would like to request an issue be discussed at Parliament you should speak to the Clerk of the Student Parliament either at the Union Office, Ground Floor Room 13, The David Hockney Building, or by emailing suparliament@bradfordcollege.ac.uk. Items should be recieved 7 days before the published meeting date.